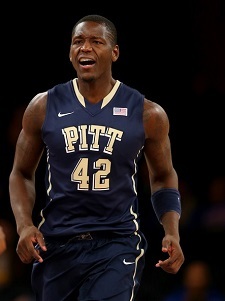 If the University of Pittsburgh men’s basketball program was still looking to make a big splash in its first season in the Atlantic Coast Conference, Talib Zanna helped cause a major disturbance in the waters on Friday. The 6-9 senior center, a Muslim from Nigeria, posted 19 points and a career-high 21 rebounds in the Panthers’ 80-75 victory over North Carolina in the ACC tournament quarterfinals. North Carolina and Duke are the ACC’s preeminent programs in terms of history and prestige. The power conference welcomed Big East refugees Syracuse, Notre Dame and Pitt before this season, and while the ‘Cuse wasted little time establishing themselves as a national-title contender and spent some time ranked No. 1 in the country, Pitt quietly posted the fifth-best record in the conference and went into this week’s ACC tournament unranked nationally despite having the same overall record as No. 15 North Carolina. Zanna’s dominant play in the paint helped the Panthers build a 20-point lead midway through the second half against the Tar Heels on Friday, but UNC rallied and cut the margin to three with 11 seconds left. Clutch free throws allowed Pitt to hang onto the lead and set up a semifinal matchup with Virginia, the sixth-ranked team in the country. Zanna’s 21 rebounds were two shy of the ACC tournament single-game record, and his 10 offensive boards were just one fewer than North Carolina managed as a team.